Every dog is special but here is the story of mine. In August of 2017, my girlfriend and I decided to adopt a dog. 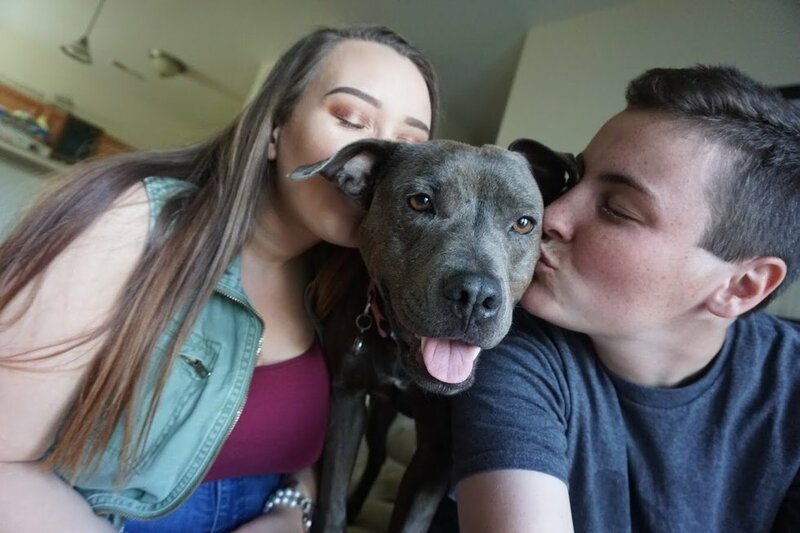 We had been together for about 2 years and we thought it was the perfect time to take a big step in our relationship and also add a furry friend to our lives. We both agreed that we wanted to adopt instead of shop because we knew there was a pup out there who had a rough time and needed a loving home. So, we went to the animal shelter and hoped for the best. It was so hard walking through the halls of the shelter seeing cute face after cute face and not being able to adopt them all! My mind created the worst possible past for every dog I saw and anger fueled inside of me at the people who gave up on these animals and threw them away like the meant nothing. Despite my overwhelming emotions, my heart stopped when I saw her. Laying on a sad excuse for a "cot" and a ripped up rag of a blanket, she was the only dog in the entire shelter who wasn't barking and scratching at the cage to get out. She had a sign on her cage that said, "I just had surgery. I can go out and play, but please be slow and gentle." I'm guessing this signed turned a lot of people away from her. But not us. My girlfriend and I knelt down and smiled at her. We put our hands through the holes of the cage and showed her we were friendly. Although it took some time, she stood up and came to sniff our hands. As soon as she was comfortable, we took her out to the back to play and get to know her. As soon as we got outside, she started sniffing the ground immediately and in about 30 seconds, she had used the bathroom. Most of the other dogs had used the bathroom in their cages. Right away we could tell that she had been a part of someone's home before. She was house trained. Someone had taken the time to train and raise her and then gave up on her. As we started trying to play with her, we noticed that all she really enjoyed was being pet. She loved belly rubs and scratches behind her ears. She just wanted attention. She just wanted love. I remember looking at my girlfriend and being like, "are we really doing this?" And she said, "Yeah. Why? Are you changing your mind?" I said "No. I've already fallen in love. She's the one." So we took her home. The shelter had given her a name since she was found with no tags or chip, but she didn't respond to it. Since she was only 2 years old, we figured we could train her to respond to a new name. He real name. He forever name: Hazel! Hazel slept in our bed the first night. She slept for close to 10 continuous hours. We figured this was the first time she probably truly rested in a long time. The first couple of days were hard. She wouldn't eat, she slept all the time, and although she seemed comfortable, she acted like she was sad. Once she settled in, we took her to the vet. "She's depressed." The vet was talking to us and all I could think was "I didn't know dogs could become depressed." But they do. Their symptoms are similar to humans in that they are fatigued and only want to sleep and they don't have an appetite. 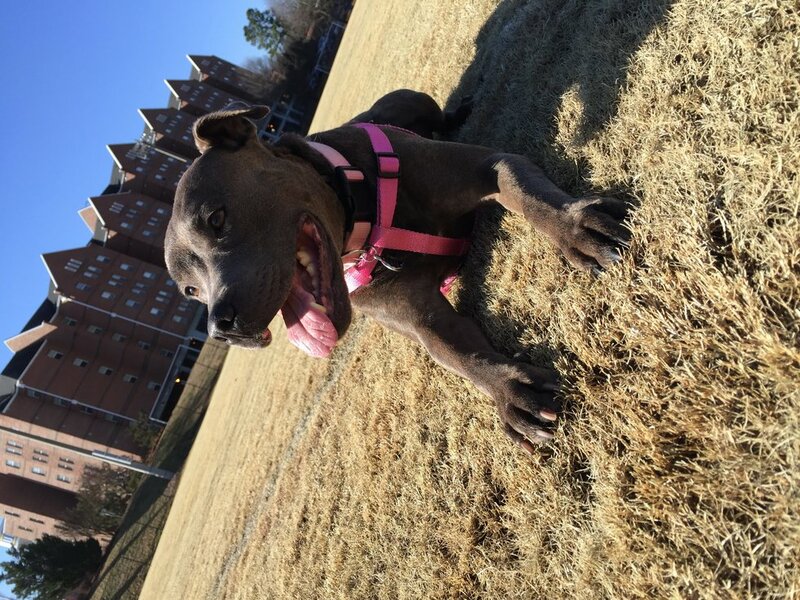 Along with her depression, we were told that Hazel had double chronic ear infections, was not at a healthy weight, and had many scars that needed to be monitored closely. All of these issues were caused by lack of funding at the animal shelter, malnutrition from being a stray, and negligence of her previous owner. "Give her three months. You'll have a different dog, I promise." I wanted to believe the vet, I really did. But I had never seen a dog depressed like this. She wouldn't play with toys, barely ate, had bald patches all over her body from lack of nutrition, scratched and cried over her aching ears, and wasn't accepting of the love my girlfriend and I so desperately wanted to give her. But slowely, she started to eat. And she ate a lot! Then she sort of figured out what a toy was. And boy oh boy did she discover her love for walks and the outdoors! Her scars started healing, her chronic ear infections were being treated, and the vitamins we were giving her started helping her hair to grow and body to become stronger. Hazel is now at a healthy weight with no more ear infections. Her scars are healed and all her hair has grown back! She probably eats more than she should and loves treats! Balls are her favorite and she loves running outside. It seems like a miracle, but she is finally happy. 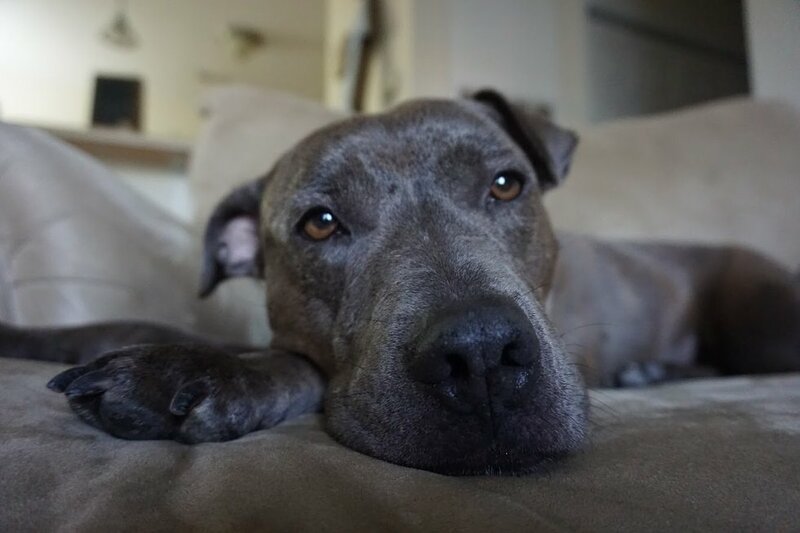 So you're probably asking, why shouldn't someone adopt a Pit Bull? Well, because your heart will be forever changed. You will realize the stereotypes about this "aggressive bread" aren't true. You will start to hate the individuals who use them for fighting or breading or those who neglect them and leave them on the street. You will fall COMPLETELY in love with them. Your life will never be the same and...you'll want to adopt every Pit Bull you see from now on.